Development of industrialisation has contributed to a considerable rise in greenhouse gas (GHG) emissions, which cause global warming. By signing the United Nations Framework Convention on Climate Change, Slovenia joined the efforts to reduce the influence of human activity on the environment. The next step in this direction was the Kyoto Protocol the signing of which committed Slovenia to reduce its emissions by 8% in respect of the 1986 base year, within the first target period 2008-2012. 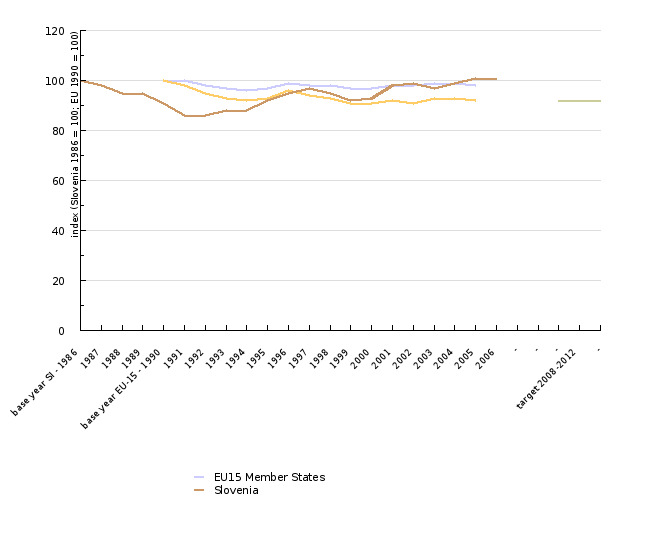 The indicator shows the trend of total greenhouse gas emission quantities in Slovenia and main source categories. The quantities are calculated using the IPCC methodology (IPCC – Intergovernmental Panel on Climate Change). With accession to the Kyoto Protocol, Slovenia has committed to achieve an 8% reduction in its emissions of greenhouse gases by the period 2008-2012 in respect of the value as identified in 1986. Slovenia also has to fulfil its reporting obligations according to the United Nations Framework Convention on Climate Change and the Kyoto Protocol. The greatest contributor among the emissions of greenhouse gases in 2003 was carbon dioxide – CO2 (81,3 %), which results mailny from fuel combustion; the second largest contributor was methane – CH4 (10 %), mostly deriving from wastes and agriculture, and third nitrogen dioxide – N2O (7.6%), deriving from agriculture as well. Also noticeable were traffic-related emissions. Emissions of F-gases which include hydrofluorocarbons (HFCs), perfluorocarbons (PFCs) and sulphur hexafluoride (SF6), are very small, but due to high greenhouse potential, their contribution to global warming is far from insignificant (1,1 %). 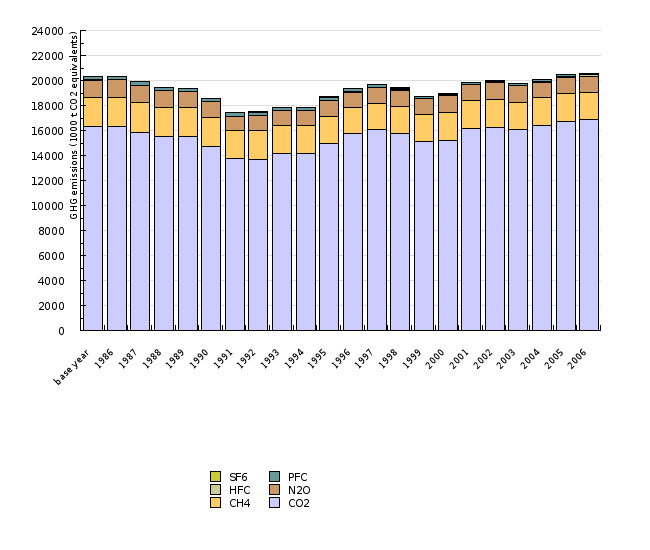 Emissions of greenhouse gases in 2003 amounted to 19803 Gg in CO2 equivalents, i.e. almost two percents below the value in the base year. In order to fulfil the obligations arising from the Kyoto Protocol it was therefore necessary to introduce additional measures. The majority of them are described in the Operational Programme for the Reduction of Greenhouse Gas Emissions, drawn up and adopted by the Government of the Republic of Slovenia in 2003. For the reduction of greenhouse gas emissions in the area of energy production and consumption, the Energy Act was adopted in 1999, and the National Energy Programme (NEP) has been drawn up as well. Both these documents envisage a sustainability-oriented development of the energy sector by enhancing the effectiveness of energy as well as consumption of renewable energy sources. In 2005, one of the three most essential Kyoto mechanisms has begun functioning as well, i.e. trade in greenhouse gas emissions, which includes 97 installation operators from Slovenia. In the EU, emission trading will be introduced in the period 2005-2007, and on a global level, in the period 2008-2012. Although total emissions have not changed significantly in comparison with the base year, there is a considerable change in their distribution by sector. The highest, more than 100% rise occurred in traffic emissions, the majority of them resulting from the increase in personal traffic; however, this is exactly the segment for which Slovenia has not yet developed an integrated development programme. The growth in total emissions is also due to emissions arising from fuel consumption in residential and commercial sectors, as well as emissions from wastes. In the light of the loss of the Yugoslav markets, abandonment of non-profitable production and increase in productivity, the decrease in emissions has been principally contributed to by manufacturing industries. The decrease occurred both in emissions arising from fuel consumption and process emissions. For the purposes of maintaining competitiveness, trade in emissions and the IPPC Directive, the industrial sector is encouraged to make use of currently best available technology (BAT). Forests cover more than 56% of Slovenia’s land surface and constitute an important source of reducing GHG emissions. Calculations of sinks are considerable due to land use change and forestry; in 2003, CO2 sinks reached 5561 Gg, exceeding a much lower recognizable level. On the basis of the condition stipulating that these sinks must be a direct result of human activity so that the state may use them for the purposes of fulfilling its obligations, an assessment was selected according to which it will be possible to make use of at least 840 Gg CO2 during the period 2008-2012. Greenhouse Gas Emission Inventory for 1986 and 1990-2006, Environmental Agency of the Republic of Slovenia, April 2005. For the purposes of reporting according to the Framework Convention of the United Nations on Climate Change, using IPCC methodology, records were made of emissions of greenhouse gases for 1986 and 1990-2003, provided in CRF format (i.e. Common Reporting Format). In the future, greenhouse gas emissions will be reported once a year, by 15 March for the year immediately preceding the previous year. In the event that new data are available or calculation methods used have been changed, recalculations must also be made for older periods. The accuracy of calculations and the appropriateness of the data used shall be supervised by the Convention Secretariat with annual revisions of reports. Calculations of emissions from fuel consumption sectors and partially also industrial processes are fairly accurate, while assessments in the areas of agriculture and wastes are appreciably less reliable, owing to the nature of the process. Supporting studies for 2nd/3rd state report to the conference of parties to the Framework Convention of the United Nations on Climate Change, Final Report, MESP, July 2004. 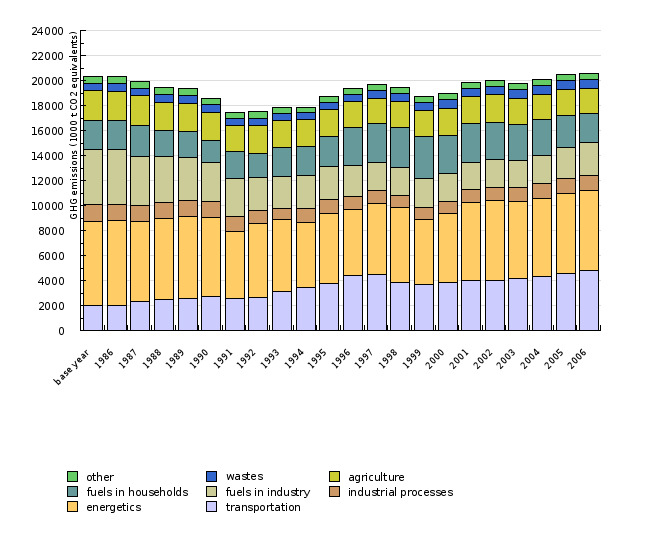 EEA Technical Report 6/2006, Annual European Community Greenhousegas Inventory 1990-2005 and inventory report 2006.